Star Trek Takes Place in Marvel's Comic Universe? The aliens of Star Trek may come to Marvel's Comic Universe... but just how badly will reality be warped to make it happen? The Trekkies out there can hold off on assuming that they'll be seeing a Klingon/Kree war, or a Borg/Skrull offensive any day now - although now that we've said it, those potential events may be hard to forget. For the time being, fans have another reason to look forward to Marvel's outlandish Cosmic Ghost Rider comic series. Spinning out of the incredible Thanos comic series that saw Frank Castle named the final Ghost Rider and Herald of Galactus, it looks like the former Punisher is going to try to save the universe. And inject - or reveal? 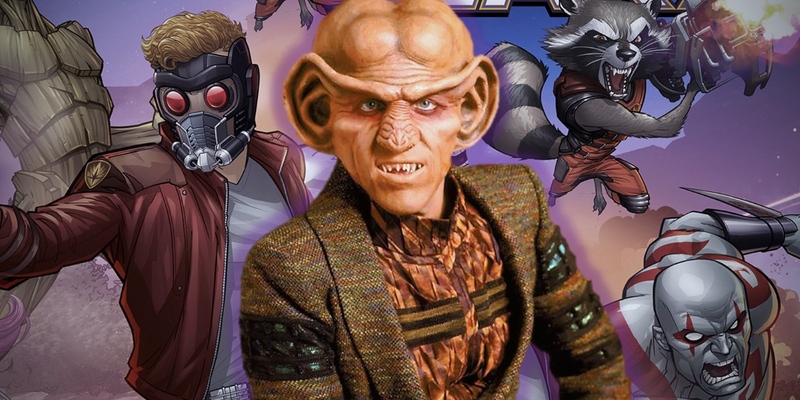 - the Ferengi in Marvel's comic book reality in the process. The tongue-in-cheek cameo comes thanks to the official solicitations for Cosmic Ghost Rider #3, set to release in September of 2018. It's still unclear just how writer Donny Cates will attempt to launch the Cosmic Ghost Rider on a mission all his own, but the official synopses confirm he will attempt to save the universe. And in a way so obvious, he can't believe nobody has tried it before. We'll assume that the slightly purple-ish color is all that's needed to keep this nod in the 'just having fun' territory, and not the 'you'll be hearing from our lawyers' alternative. Still, seeing that one of the most recognizable aliens from Star Trek lore exist within Marvel's many realities means the same may go for the rest of the universe. The Ferengi isn't the only recognizable alien that can be discerned in the crowd scene, either. But we doubt the purple alien resembling one of Mass Effect's Turians - slightly to the right - will be further developed, either. This isn't the only case of Marvel Comics working other properties into their own shared multiverse (and certainly not the first time a comic book publisher has shown Trek some low-key reverence). But it comes as part of a much larger resurgence in Marvel's playful pop culture references. More recently, it's been their biggest competitor DC comics to have gotten all the jokes or playful jabs. With Shazam now an alternate reality 'Captain Marvel,' and members of the Inhumans traveling to DC's Universe, it's not that odd to see the Ferengi pop up in another form of outer space. A similar logic makes the suggestion that in one of Marvel's many parallel realities, a Captain Marvel resembles Green Lantern. After all, space is space. Hopefully, this is just the first of many that the creative team building Cosmic Ghost Rider has to unleash, beginning with Issue #1 coming July 4th, 2018.